If you are looking for a pet that is loving, intelligent and energetic, you may fall in love with the Somali cat. Intensely affectionate, this breed is extroverted and friendly, which makes it an excellent choice for a family with children. The Somali cat is a long-haired version of the Abyssinian and first appeared in the 1950s when kittens in a breeding program were born with long fur. In fact, the only real difference between the Abyssinian and the Somali is the length of the fur. This recessive gene was not considered appealing among breeders until the 1960s when a breeder entered her long-haired kitten in a show as a joke. The judge was smitten. He requested the kitten and began his own breeding program. Somali cats have a distinctive look to them that is recognizable by any cat lover. You can also check out the Cat Fanciers' Association breed standard to learn about the finer points of this breed. The full ruff and large ears make this breed resemble a fox. The cat has a dark rim around his eyes which gives him an exotic look and adds to the fox-like appearance. There is an 'M' pattern in the middle of the cat's forehead which is both desirable and allowable. A Somali will have a bit of white on the muzzle, chin, and throat, but the cat should not have white anywhere else. Somalis are considered a medium-size cat. Their average weight is between 6 to 10 pounds. Somali cat paws also are unusual in that they can "hold" items in them as if they actually had thumbs. A Somali cat's tail is fluffy, and he often sports a dark stripe down the back. 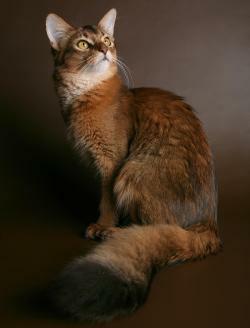 The Somali has been given the name "fox cat" in part because of its bushy fox-like tail. Despite the long fur, Somalis don't shed on a regular basis. Instead, they shed their coats in a large quantity twice a year or so. The coat is ticked, a variant of tabby markings. While some Somali cats may have a full tabby coat, this is not an acceptable breed pattern. Cats with these markings will be sold as neutered pets only so as not to contribute the markings back into the gene pool. Any of these combinations and variations are acceptable except the tabby pattern. Just as they have a unique look, the personality of the Somali cat is something special. Somalis are very outgoing and loving, and they make great pets for families with children. Although they are affectionate, they don't like to sit still much and are more likely to help you with your cleaning chores than they are to sit in your lap as you watch television. Like a dog, the Somali enjoys a quick game of fetch, but she will also enjoy hide and seek. This active breed will benefit from toys and items like cat trees which give them plenty of things to chase and climb. Like all cats, they are best kept as an indoor pet. Since the Somali is very social, it is best to have a second cat as a companion if your family is away from home during the day or for long periods of time. They do well in multi-pet households where they can be entertained by the other pets. These intelligent cats get bored easily when they are alone, and that can spell trouble. Somalis do not have a lot of health problems, but there are a few issues associated with this breed. The average lifespan of a Somali cat is between 11 and 16 years. Most cats are prone to gingivitis no matter what the breed and Somalis are no exception. Be sure to give your pet a high-quality dry food along with any canned food that you give her. This helps to keep the teeth clean and gums healthy. Some Somalis can get a type of anemia called Auto Immune Hemolytic Anemia, usually referred to as AIHA. If you suspect your cat is anemic, you should ask your vet about this disease and request a PCV blood test. The PCV is not a normal part of a blood workup so it is important that it be requested. This disease is a congenital condition found in Somalis and their Abyssinian counterparts. The deficiency refers to an enzyme needed for blood cells to metabolize and the result can be anemia. 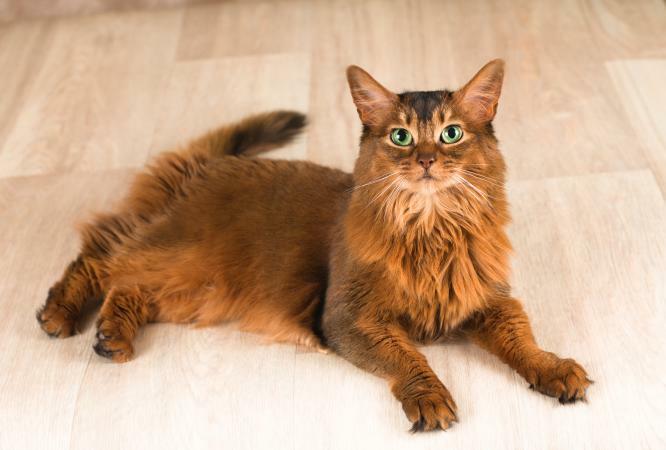 A DNA test can be performed to determine if a Somali cat is at risk of PK deficiency. Another genetic condition that also affects Somalis and Abyssinians is Amyloidosis. This condition can lead to impairment and eventual failure of the kidneys. Despite their long coat, Somalis are very easy to care for. Their only grooming requirement is a brushing once a day as well as regular nail trimming and ear cleaning. Since there are not a great number of Somalis, it can be difficult to find a breeder. It is usually best to buy from someone locally, if possible so that you can physically examine your kitten and ask questions. Try to get references and referrals. It is a good idea to talk to others who have purchased a pet from the breeder and find out how their experience was and if they have had health problems with their new pet. As a starting place you can check Fanciers Breeder Referral List for breeders in your area. This list was started in 1994 and has been helping potential cat owners find quality breeders since that time. How Much Is a Somali Cat? If you decide to buy a Somali kitten from a breeder, the average price is from $1,000 to $1,500. It can be much higher for a show quality cat. Choosing a Somali cat will give you a companion that is very willing to be involved in literally everything you do. She will entertain you with her antics and can even learn a few tricks to impress your friends. On the other hand, don't even consider this breed if you are looking for a quiet lap cat.